Calendar of Treasury Books, Volume 13, 1697-1698. Originally published by His Majesty's Stationery Office, London, 1933. Eachwick, Echwick, co. Northumberland, 419. Eales, Samuel, surveyor of duties on houses and marriages, etc. for Westminster, 253. Eare (Aires, Earl), Gilbert, solicitor, defalcation by, 38, 40, 169, 383. -, -, lease of tenements in Treverbyn Courtney manor, 117, 239. Earle, , assistant Gentleman Usher, 389. -, Matthew, [Customs officer], 69. 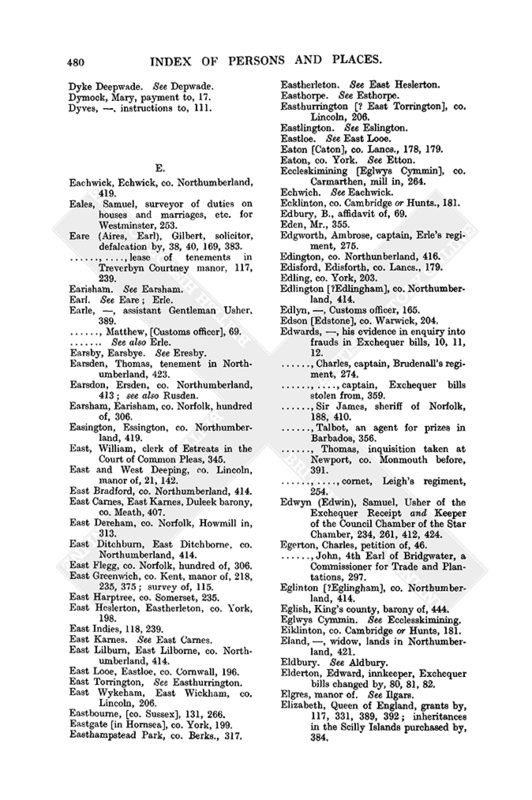 Earsden, Thomas, tenement in Northumberland, 423. Earsdon, Ersden, co. Northumberland, 413; see also Rusden. Earsham, Earisham, co. Norfolk, hundred of, 306. Easington, Essington, co. Northumberland, 419. East, William, clerk of Estreats in the Court of Common Pleas, 345. East and West Deeping, co. Lincoln, manor of, 21, 142. East Bradford, co. Northumberland, 414. East Carnes, East Karnes, Duleek barony, co. Meath, 407. East Dereham, co. Norfolk, Howmill in, 313. East Ditchburn, East Ditchborne, co. Northumberland, 414. East Flegg, co. Norfolk, hundred of, 306. East Greenwich, co. Kent, manor of, 218, 235, 375; survey of, 115. East Harptree, co. Somerset, 235. East Heslerton, Eastherleton, co. York, 198. East Karnes. See East Carnes. East Lilburn, East Lilborne, co. Northumberland, 414. East Looe, Eastloe, co. Cornwall, 196. East Wykeham, East Wickham, co. Lincoln, 206. Eastbourne, [co. Sussex], 131, 266. Eastgate [in Hornsea], co. York, 199. Easthampstead Park, co. Berks., 317. Easthurrington [? East Torrington], co. Lincoln, 206. Eaton [Caton], co. Lancs., 178, 179. Eaton, co. York. See Etton. Eccleskimining [Eglwys Cymmin], co. Carmarthen, mill in, 264. Ecklinton, co. Cambridge or Hunts., 181. Edbury, B., affidavit of, 69. Edgworth, Ambrose, captain, Erle's regiment, 275. Edisford, Edisforth, co. Lancs., 179. Edlington [?Edlingham], co. Northumberland, 414. Edlyn, , Customs officer, 165. Edson [Edstone], co. Warwick, 204. Edwards, , his evidence in enquiry into frauds in Exchequer bills, 10, 11, 12. -, Charles, captain, Brudenall's regiment, 274. -, -, captain, Exchequer bills stolen from, 359. -, Sir James, sheriff of Norfolk, 188, 410. -, Talbot, an agent for prizes in Barbados, 356. -, Thomas, inquisition taken at Newport, co. Monmouth before, 391. -, -, cornet, Leigh's regiment, 254. Edwyn (Edwin), Samuel, Usher of the Exchequer Receipt and Keeper of the Council Chamber of the Star Chamber, 234, 261, 412, 424. Egerton, Charles, petition of, 46. -, John, 4th Earl of Bridgwater, a Commissioner for Trade and Plantations, 297. Eglinton [?Eglingham], co. Northumberland, 414. Eglish, King's county, barony of, 444. Eiklinton, co. Cambridge or Hunts, 181. Eland, , widow, lands in Northumberland, 421. 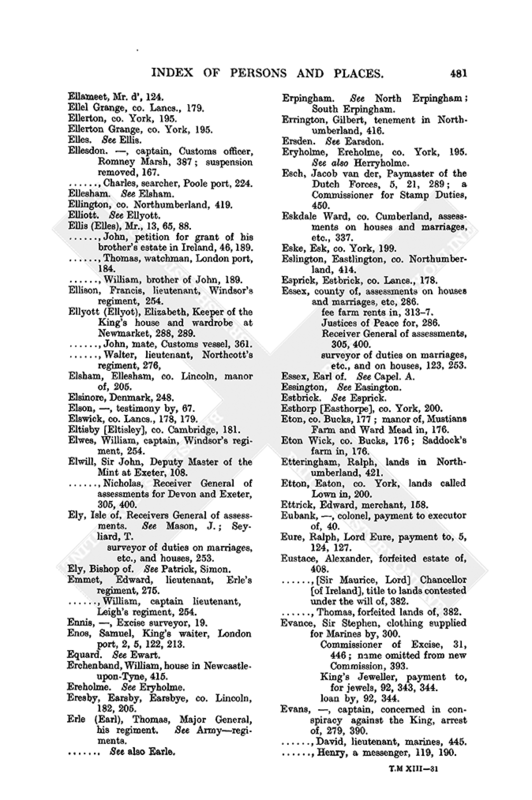 Elderton, Edward, innkeeper, Exchequer bills changed by, 80, 81, 82. Elgres, manor of. See Ilgars. Elizabeth, Queen of England, grants by, 117, 331, 389, 392; inheritances in the Scilly Islands purchased by, 384. Ellel Grange, co. Lancs., 179. Ellerton Grange, co. York, 195. Ellesdon. , captain, Customs officer, Romney Marsh, 387; suspension removed, 167. -, Charles, searcher, Poole port, 224. Ellis (Elles), Mr., 13, 65, 88. -, John, petition for grant of his brother's estate in Ireland, 46, 189. -, Thomas, watchman, London port, 184. -, William, brother of John, 189. Ellison, Francis, lieutenant, Windsor's regiment, 254. Ellyott (Ellyot), Elizabeth, Keeper of the King's house and wardrobe at Newmarket, 288, 289. -, John, mate, Customs vessel, 361. Elsham, Ellesham, co. Lincoln, manor of, 205. Elson, , testimony by, 67. Elswick, co. Lancs., 178, 179. Eltisby [Eltisley], co. Cambridge, 181. Elwes, William, captain, Windsor's regiment, 254. Elwill, Sir John, Deputy Master of the Mint at Exeter, 108. -, Nicholas, Receiver General of assessments for Devon and Exeter, 305, 400. Ely, Isle of, Receivers General of assessments. See Mason, J.; Seyliard, T.
-, surveyor of duties on marriages, etc., and houses, 253. Ely, Bishop of. See Patrick, Simon. Emmet, Edward, lieutenant, Erle's regiment, 275. -, William, captain lieutenant, Leigh's regiment, 254. Ennis, , Excise surveyor, 19. Enos, Samuel, King's waiter, London port, 2, 5, 122, 213. Erchenband, William, house in Newcastleupon-Tyne, 415. Eresby, Earsby, Earsbye, co. Lincoln, 182, 205. Erle (Earl), Thomas, Major General, his regiment. See Armyregiments. Erpingham. See North Erpingham; South Erpingham. Errington, Gilbert, tenement in Northumberland, 416. Eryholme, Ereholme, co. York, 195. See also Herryholme. Esch, Jacob van der, Paymaster of the Dutch Forces, 5, 21, 289; a Commissioner for Stamp Duties, 450. Eskdale Ward, co. Cumberland, assessments on houses and marriages, etc., 337. Eske, Esk, co. York, 199. Eslington, Eastlington, co. Northumberland, 414. Esprick, Estbrick, co. Lancs., 178. Essex, county of, assessments on houses and marriages, etc, 286. -, fee farm rents in, 3137. -, Justices of Peace for, 286. -, Receiver General of assessments, 305, 400. -, surveyor of duties on marriages, etc., and on houses, 123, 253. Essex, Earl of. See Capel. A.
Esthorp [Easthorpe], co. York, 200. Eton, co. Bucks, 177; manor of, Mustians Farm and Ward Mead in, 176. Eton Wick, co. Bucks, 176; Saddock's farm in, 176. Etteringham, Ralph, lands in Northumberland, 421. Etton, Eaton, co. York, lands called Lown in, 200. Eubank, , colonel, payment to executor of, 40. Eure, Ralph, Lord Eure, payment to, 5, 124, 127. Eustace, Alexander, forfeited estate of, 408. -, [Sir Maurice, Lord] Chancellor [of Ireland], title to lands contested under the will of, 382. -, Thomas, forfeited lands of, 382. Evance, Sir Stephen, clothing supplied for Marines by, 300. -, Commissioner of Excise, 31, 446; name omitted from new Commission, 393. -, King's Jeweller, payment to, for jewels, 92, 343, 344. -, loan by, 92, 344. Evans, , captain, concerned in conspiracy against the King, arrest of, 279, 390. -, David, lieutenant, marines, 445. -, Henry, a messenger, 119, 190. -, John, lieutenant, Bridge's regiment, 438. -, Mary, widow, royal bounty for, 438. -, Richard, searcher, Milford Haven, 350. Evat, Phillip, quartermaster, Windsor's regiment, 254. Eve, Adam, tidesman, London port, 245. Eveleigh, Nicholas, lieutenant, Erle's regiment, 275. Evelyn, John, senior, Treasurer of Greenwich Hospital, 375. -, -, his house at Deptford, used by the Czar of Muscovy, 325, 360. Everard, , discovery of counterfeited Exchequer Bills, 102. -, Patrick, forfeited lands of, 444. -, Thomas, Commissioner of Excise, 18, 19, 64, 393; charges against, 25, 29, 30, 31, 37, 41, 85; alleged a Jacobite, 412; his good services, 39, 42; his proposals to prevent frauds, 22. -, -, ship owner, 448. Everet, George, proposals of, for a tax on wool, 43, 44. Evernden, Anthony, sailcloth supplied to the Navy by, 304. Every, , a pirate, 398. Ewart, Equard, co. Northumberland, 418. Ewer, John, lieutenant, Coote's regiment, 274. Exeter, co. Devon, and Plymouth, riding officer between, 170, 243. -, fee farm rent of, 196. -, Mint at, See Mint. -, port, Customs officers at, 242, 258, 288, 298. -, Receivers General, etc. of assessments, 305, 349, 400. -, surveyor of duties on marriages, etc., and houses, 123. Exmouth, co. Devon, 170, 298. Eyles (Ayles, Isles), , memorial of the President of the Council of Barbados presented by, 89, 95. -, -, captain, remittances for victualling at Cadiz, 69, 262. -, Francis, merchant, remittances to Flanders, 38, 39. 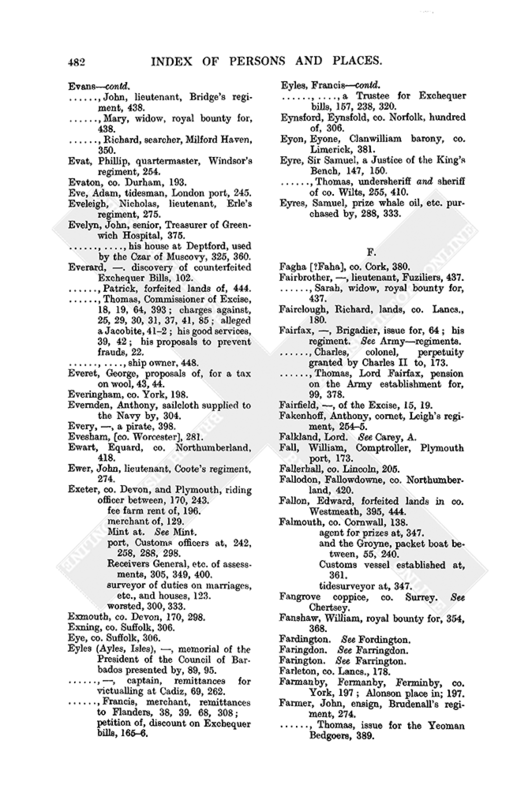 68, 308; petition of, discount on Exchequer bills, 1656. -, -, a Trustee for Exchequer bills, 157, 238, 320. Eynsford, Eynsfold, co. Norfolk, hundred of, 306. Eyon, Eyone, Clanwilliam barony, co. Limerick, 381. Eyre, Sir Samuel, a Justice of the King's Bench, 147, 150. -, Thomas, undersheriff and sheriff of co. Wilts, 255, 410. Eyres, Samuel, prize whale oil, etc. purchased by, 288, 333.